A few days back, we talked about a special type of bandage, developed by scientists at UK-based University of Bath, which turns green when a wound gets infected with bacteria. As part of another recent project, a team of UCLA researchers has created a smart hydrogel that facilitates faster healing of skin injuries by providing a porous scaffold for cellular regeneration. The technology could prove helpful in treating severe wounds especially in case of burn victims and diabetics with reduced healing capacity. The largest organ of the human body, the skin acts as a physical barrier between our somewhat-intricate anatomy and the surrounding environment. This barrier, however, gets compromised when wounds are inflicted on it. In healthy individuals, the occurrence of surface injuries automatically initiates a natural and effective healing process, which in fact slows down in case of serious wounds, often those spread over large areas. Traditionally, doctors have managed skin wounds using hydrogels, a type of water-based dressing. Although quite efficient in keeping such wounds hydrated and protected from bacterial infection, commonly-available hydrogels do little to promote skin regeneration. The current research, which appeared in the Nature Materials journal, focuses on an altogether new biomaterial containing microporous annealed particles (MAPs), basically minute synthetic spheres that are can stick to one another to create a flexible scaffold. According to the team, this structure can actually be inhabited by new cells, thus facilitating the formation of new skin and blood vessels at the wound site. As Tatiana Segura, a professor at UCLA’s Henry Samueli School of Engineering and Applied Science, points out, the concept of a biomaterial-based scaffold has been around for some time. 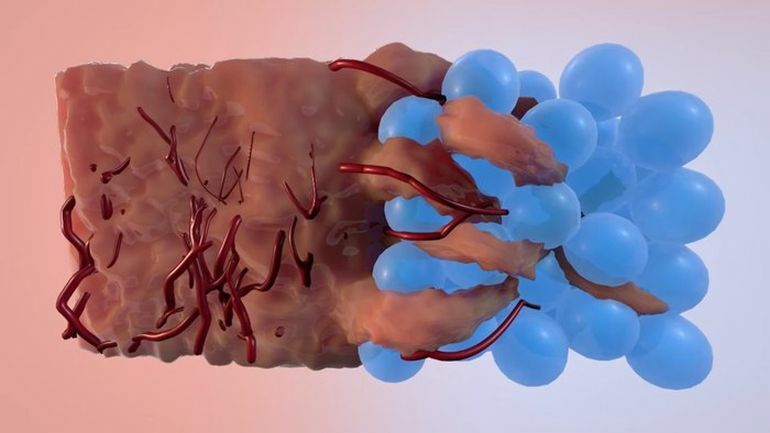 Unlike previous technologies, the MAP-infused hydrogel can efficiently take the shape of the wound, by binding together to create a porous support. To ensure proper wound healing, the dressing’s material should be such that it degrades just as new tissues begin to form. If it starting degrading earlier, the scaffold would break down. Conversely, if the material takes too long to degrade, it would inevitably lead to scarring. The newly-created hydrogel is superior, since its chemical and physical properties can be easily customized, in accordance with specific wounds. This ensures that the skin’s ideal growth environment is achieved in every case. To test the efficacy of the new technology, the researchers conducted lab experiments involving human stem cells. According to them, the MAP system successfully created a porous scaffold within just two days, with extensive skin regeneration occurring over the course of a week. Furthermore, when applied to wound of mice over a period of five days, this advanced hydrogel helped heal nearly 40-percent of the injuries. In comparison, wounds dressed with non-porous hydrogels showed no improvement at all. This novel material provides all the necessary physical properties for strong support, and degrades gradually as new skin is formed. It is elegant in both its complexity and simplicity, and offers real hope to patients struggling with debilitating wounds.